The Birchenall Award is the newest ASWA recognition, given to members of the wine media for promoting knowledge of the East Coast Wine Industry. It is named for Michael Birchenall for his many contributions to coverage of the East Coast wine and food industries. Lenn Thompson of The Cork Report receives the 2018 ASWA Birchenall Award for wine journalism. The 2018 Birchenall Award is being presented to Lenn Thompson, author of The Cork Report. Lenn Thompson founded the NewYorkCorkReport.com in early 2004 to share his passion for the wines, beers and spirits of New York State. The site became the premier source for independent New York wine commentary, reviews and news. 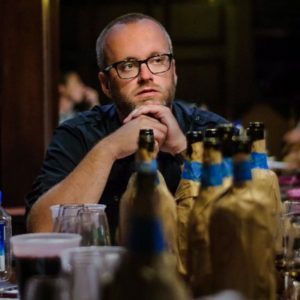 In 2016, Lenn expanded his previous undertaking and launched TheCorkReport.us adding coverage of wines of Virginia, Maryland, New Jersey, Pennsylvania, Vermont and beyond. Lenn currently serves as the wine columnist for The Suffolk Times weekly newspaper and is the former editor of the Long Island Wine Gazette. He contributes or has contributed to publications like Wine Enthusiast Magazine, Beverage Media, Edible Brooklyn, Edible East End, Edible Hudson Valley and recently on SevenFiftyDaily. Lenn served on the board of directors for Drink Local Wine, and is the creator and founder of TasteCamp, an annual regional wine immersion conference for writers and trade. An admitted riesling and cabernet franc fanatic, he’s intensely passionate about eating local and the many local wine regions of America. Paul Vigna (center) receives the Birchenail award from Grant Crandall (right). 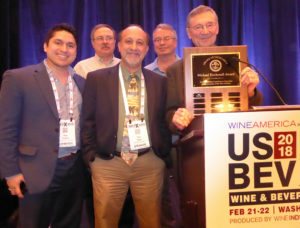 Paul Vigna from the Harrisburg, PA area is the first ever recipient of the Michael Birchenall Award, presented by the Atlantic Seaboard Wine Association to an individual whose writing in all forms of media significantly contributes to the understanding of quality wines being produced on the East Coast. An editor with PA Media Group, which includes PennLive.com and The Patriot-News, he has for many years written in a blog and many other forms of media initially focusing on wine in Pennsylvania and Maryland and later broadening out to cover wines and wineries in an area from New York to North Carolina.